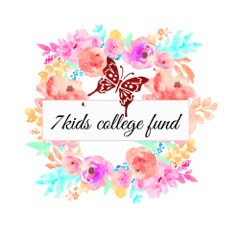 This week's sponsor is 7 Kids College Fund! Tomorrow is Halloween, I'm so excited!!! My oldest son will be "glow-in-the-dark skeleton", my twin boy will be a train (he's totally obsessed with trains! ), my twin girl told me a month before Halloween that she wants to be Elsa, so my baby girl will be Anna to go with her. Anyway, this fun color combo couldn't be more perfect! 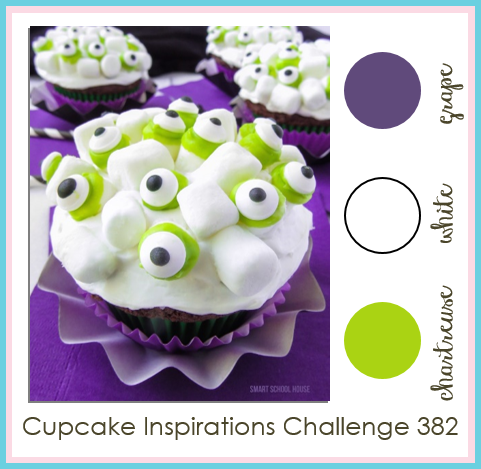 Not to mention the fun eye balls! I stamped them all with Memento Tuxedo Black Ink, colored in with Spectrum Noir Markers, then die cut with the matching die sets. Here we have is Dr.Frankenstein's monster kitty, he is my favorite! 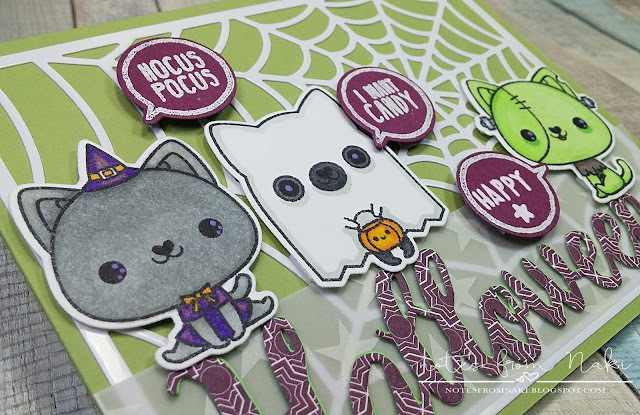 I added little purple dots with a purple gel pen in all the kitties' eyes. 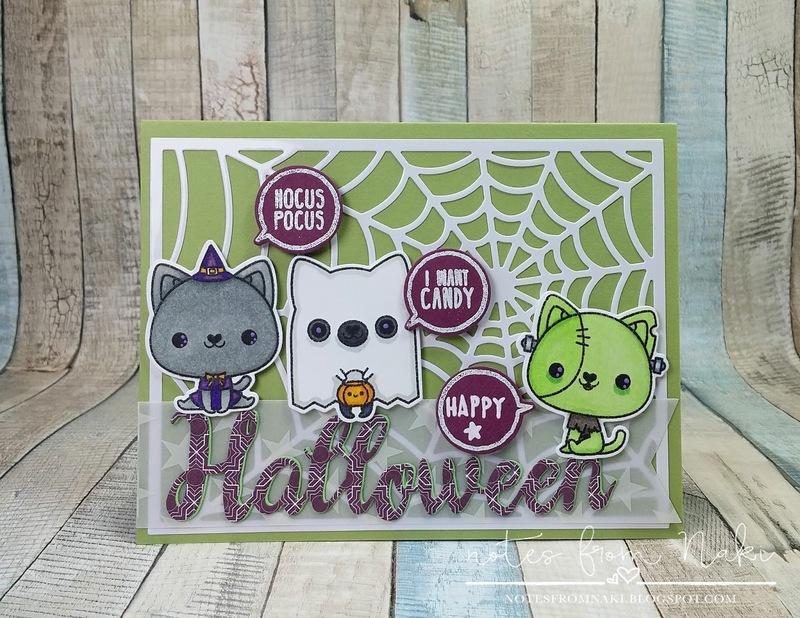 The spider web background is totally awesome, isn't it!? 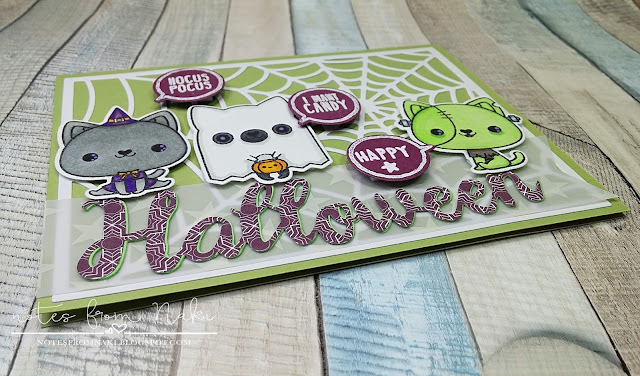 The little speech bubbles with little Halloween sayings were heat embossed except "happy", that was hand written with a white gel pen. 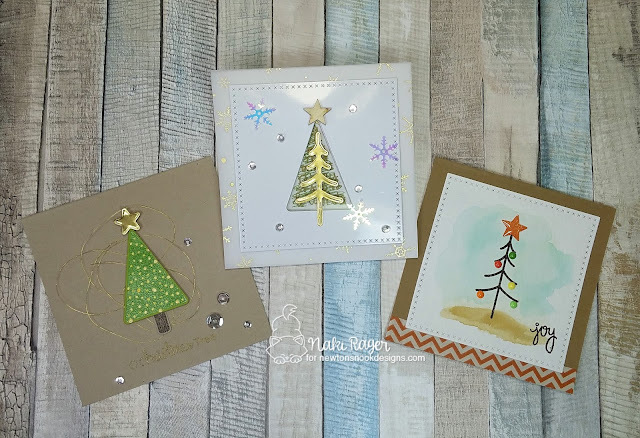 I was originally going to make 3 small cards but they look so cute together, don't they!? 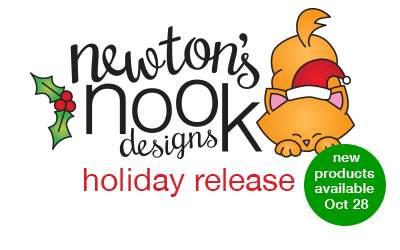 Welcome to the final day of the Newton's Nook Designs Holiday Release! 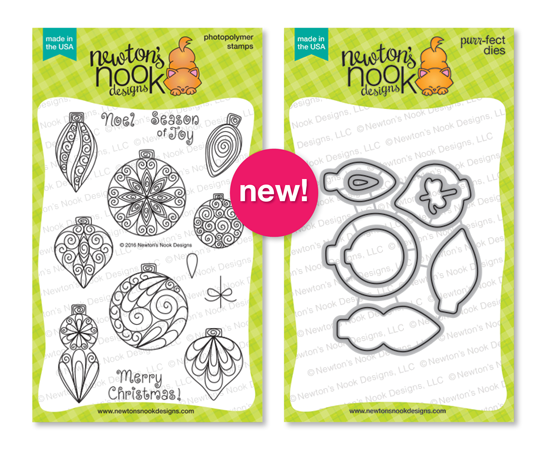 All the new goodies will be available for purchase tomorrow Friday the 28th over at the Newton's Nook Designs Shop! 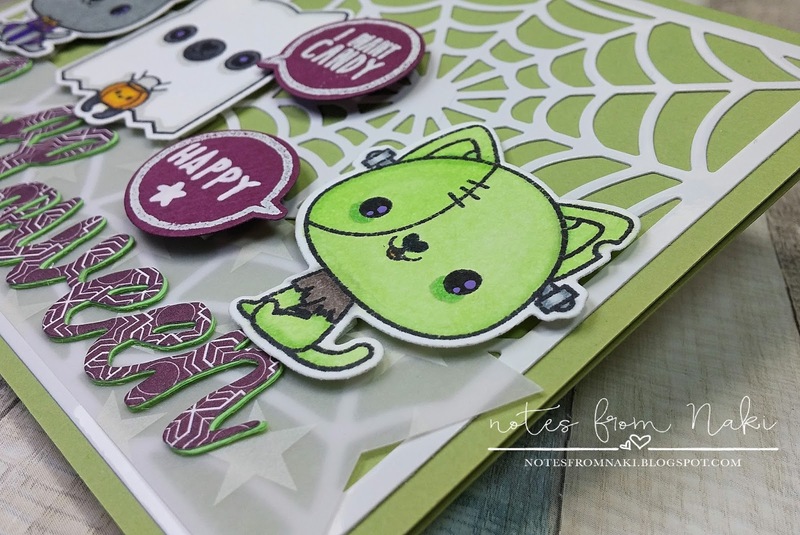 Today we are sharing 2 stamp sets along with their coordinating die sets! Newton is so mischievous and adorable! This is such a versatile and perfect set for Christmas cards! Here we have is a very naughty but super cute kitty! He couldn't help himself but to jump on one of the shinny ornaments on a tree... Now he is stuck and just dangling helplessly but cute. *Hee Hee* I have a slider behind him so he really does dangle sideway. Coloring this cutie was so much fun! 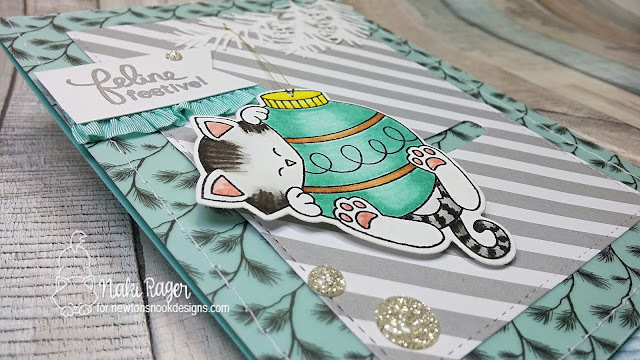 I used the Zig Clean Color Brush set, then added some shimmer on the ornament with the Pearlscent watercolor. 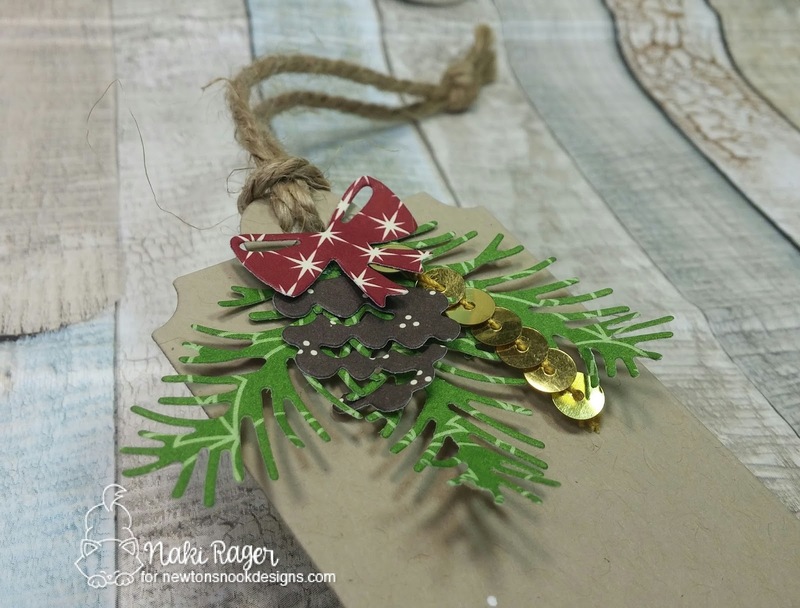 On to the Festive Forest set. This is such a fun and versatile set, so many designs just flooded my head and I had to make more than one! First up is this shinny, sparkly design! Here is my beautiful tree on the inside! 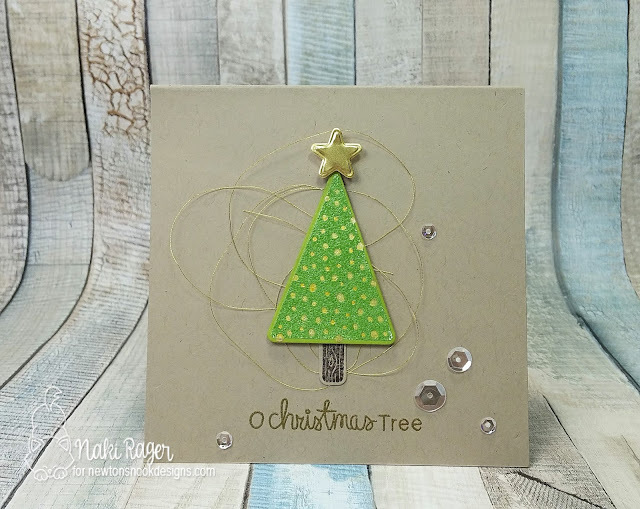 I stamped the scribbled tree image with Gumball Green then heat embossed the word tree with gold. Isn't it just gorgeous!!? Second one is more traditional look. Seriously, isn't this such a fun set!? I very much enjoyed playing with this set, this is a must have! 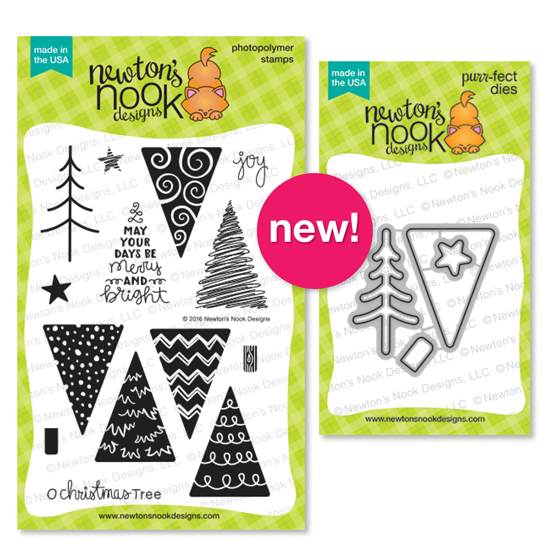 Would you like to win the “Ornamental Newton” or the "Festive Forest" Stamp Set? 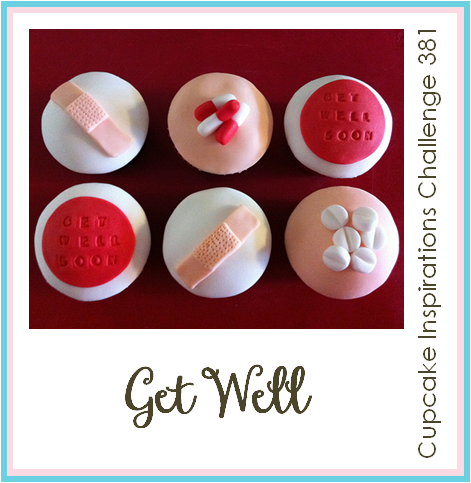 Today we will pick two winners, one to win each set! Hope you have enjoyed all the reveals this week! 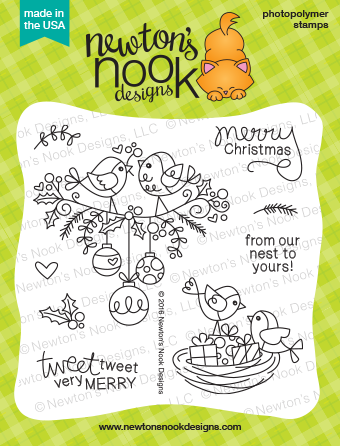 Don't forget to visit the Newton's Nook Designs Shop tomorrow! 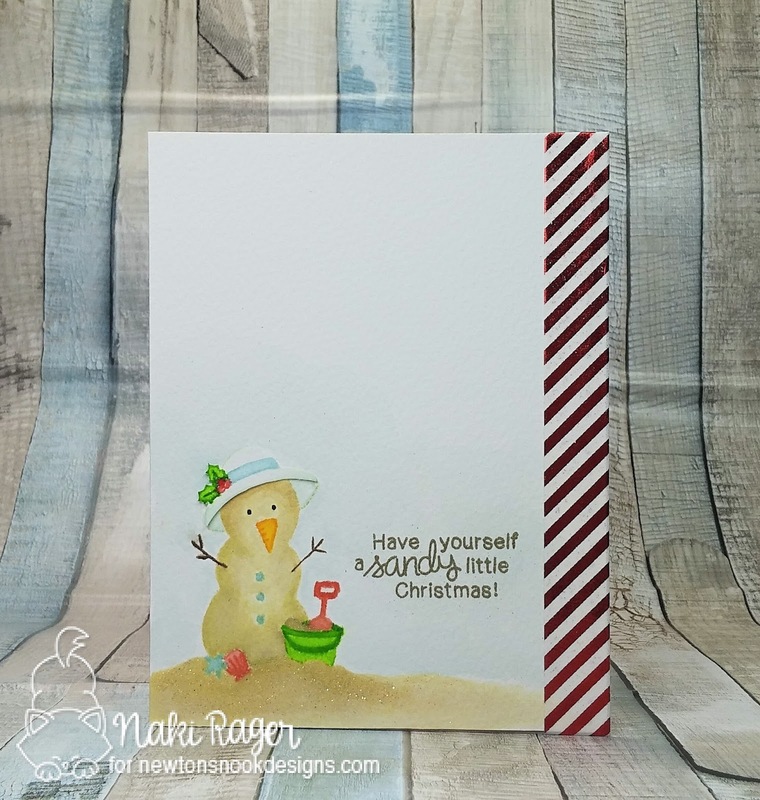 Welcome to day3 of the Newton's Nook Designs Holiday Release! 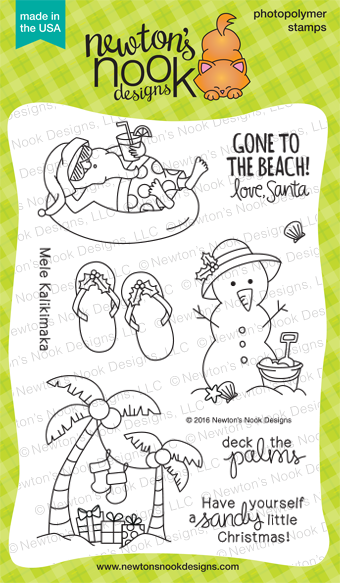 All the new goodies will be available for purchase this Friday the 28th over at the Newton's Nook Designs Shop! Today we are sharing this beautiful and adorable stamp set "Holiday Tweets". I absolutely LOVE this super tweet set! Can you hear them singing "Falalalala~"!? 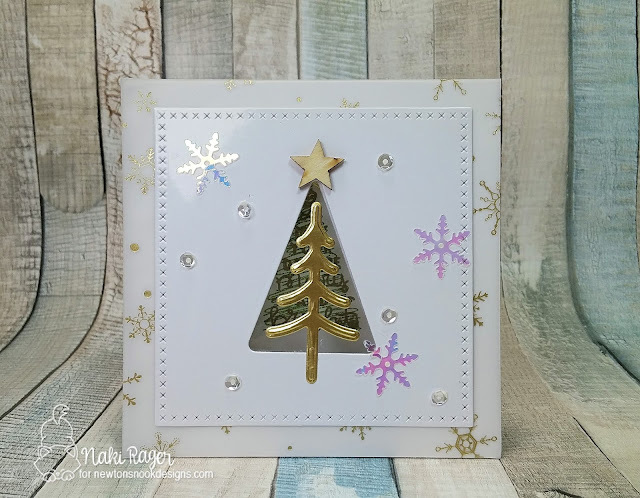 I masked the image with a die cut circle and applied embossing paste over a stencil to give some snow all over the base. 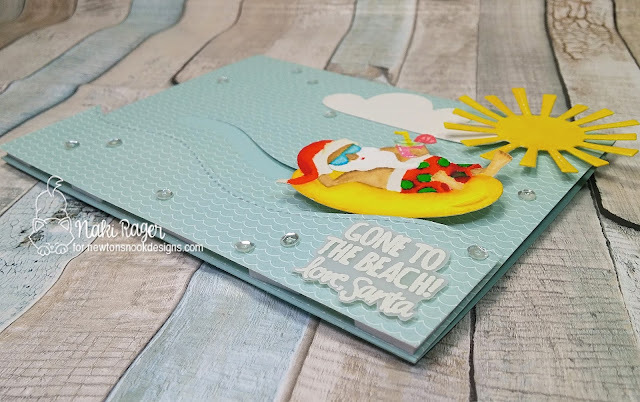 I then heat embossed the sentiment "tweet tweet Very merry" with Pool Party on vellum, adhered the die cut on the same piece of vellum and fussy cut the whole thing. I used the same soft colors on white base. 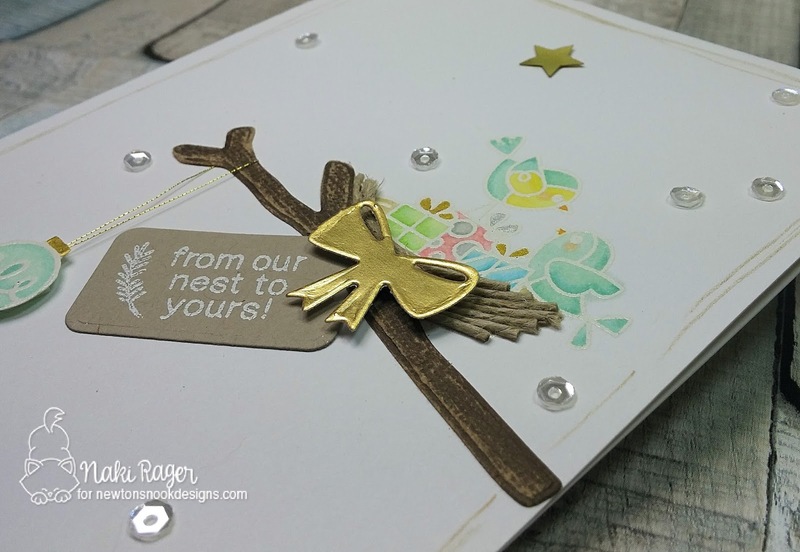 The image was heat embossed with white, colored in with Spectrum Noir Markers, added this branch, which I borrowed from the What A Hoot Purr-fect Die set, then made a nest with snippets of Jude twine. 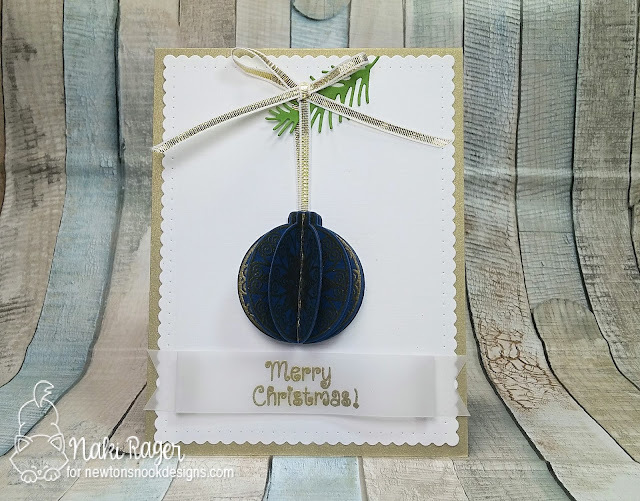 This little ornament is from the other image from the same set, it was heat embossed then fussy cut. I stamped this little branch with tiny leaves on each corner with gold ink, drew random lines with gold pencil, then of course sprinkled some sequins. Welcome to day2 of the Newton's Nook Designs Holiday Release! Today we are sharing these amazing new "Beautiful Baubles" stamp set and coordinating die set, AND the Pines & Holly Die Set! 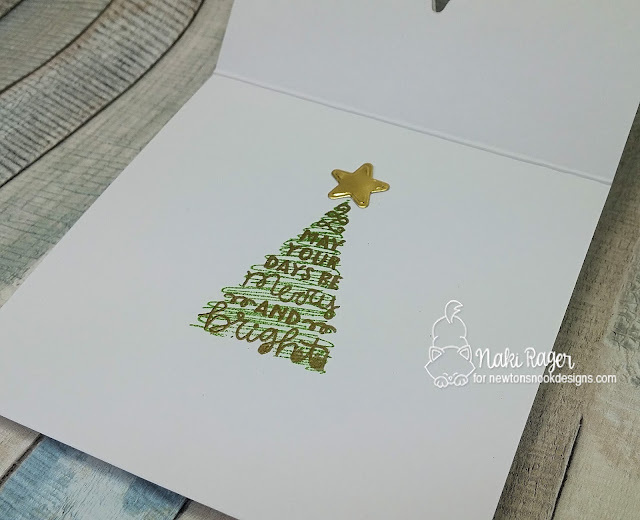 I heat embossed one of the gorgeous images with gold six times and die cut them all with the coordinating die. Then I scored on the back of each ornament, folded them in half, and glued them all together. 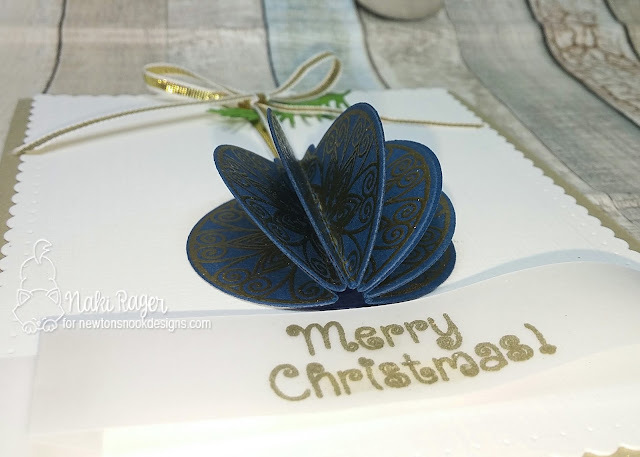 I decided to die cut another ornament and adhered the 3D ornament on it. The gold image is really just gorgeous on this deep navy, I am so sorry it is not showing! 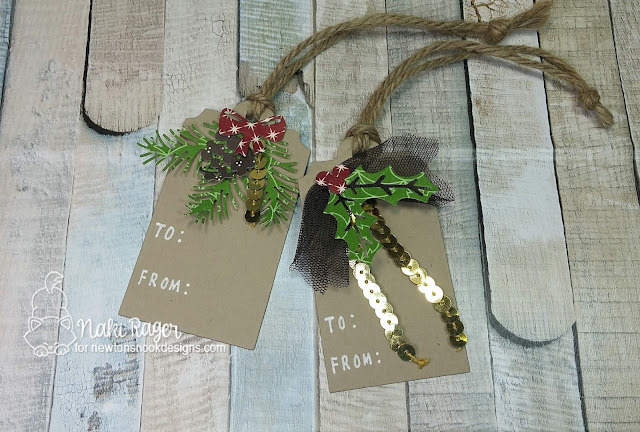 Here we have a pair of beautiful tags I made with the new Pines & Holly Die Set. I have to tall you, these are very intricate and delicate! All I added was a snippet of gold sequin trim. 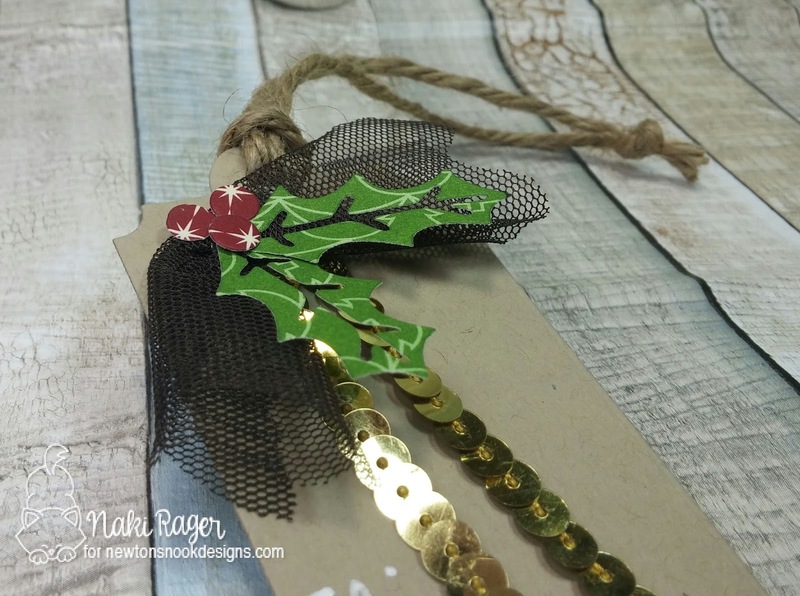 Here's a little holly, I added a longer snippet of gold sequin trim with some tulle. This die set is super versatile, there are so many possibilities! 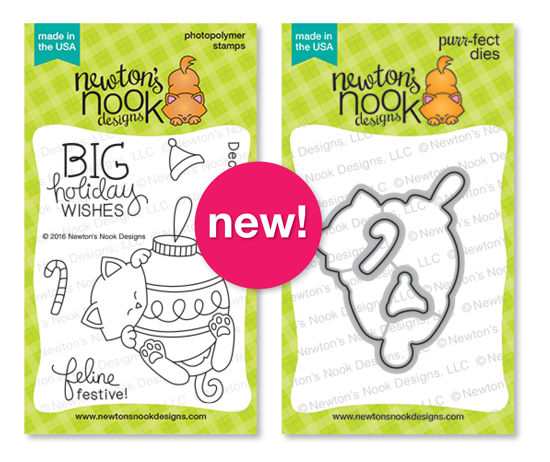 Welcome to day1 of the Newton's Nook Designs Holiday Release! Woo hoo! Today we are sharing this super fun stamp set called "Sun Soaked Christmas", are you ready!? Isn't he the cutest, most awesome Santa ever!? He does actually move like he is riding the wave, isn't it fun!? 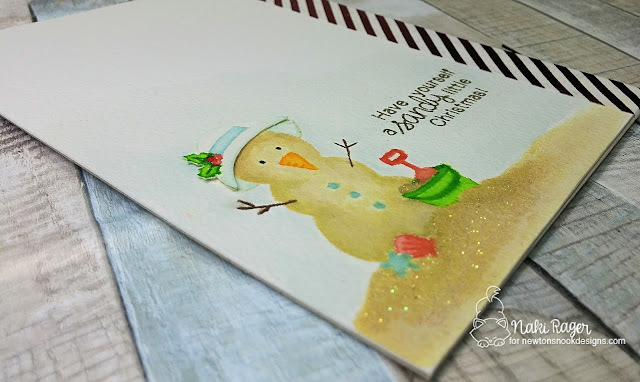 He was colored with Zig Clean Color Brush Set and the Pearlescent Watercolor set then fussy cut. His glorious beard was colored with the white gel pen. 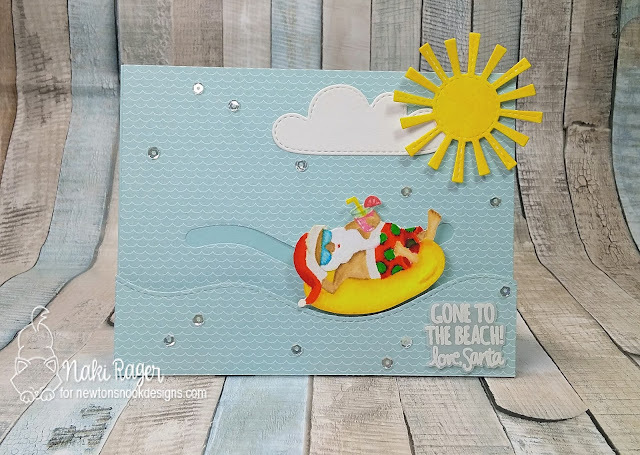 This awesome sentiment "Gone to the beach! 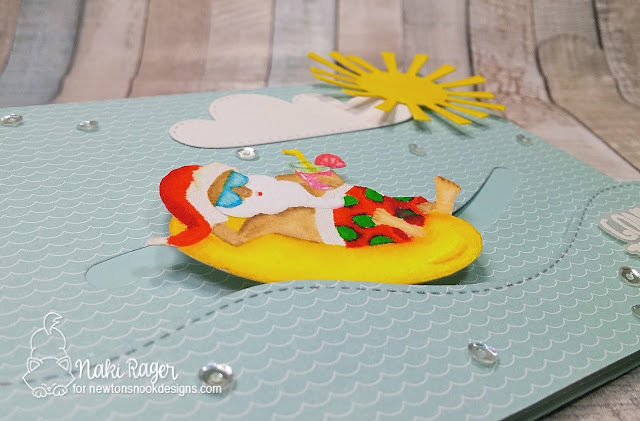 Love, Santa" was heat embossed with white on vellum, fussy cut, and popped up with clear 3D tape. 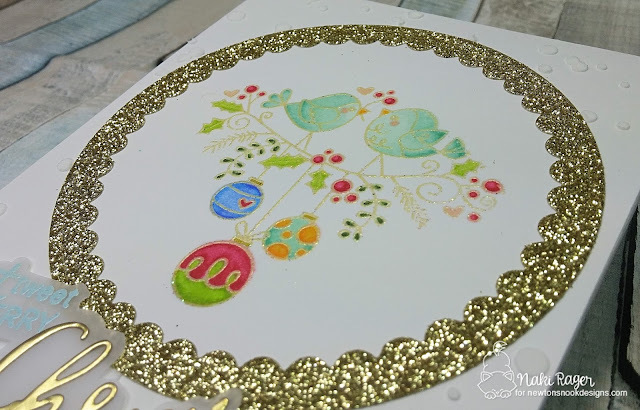 Some clear sequins were sprinkled all over for the finishing touch! 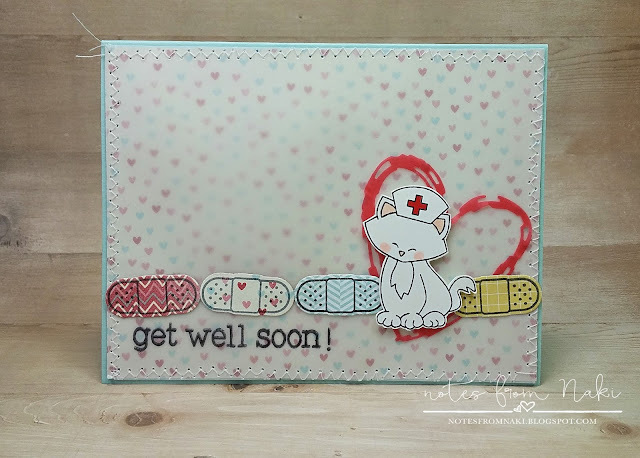 The sentiment is so stinkin' cute! 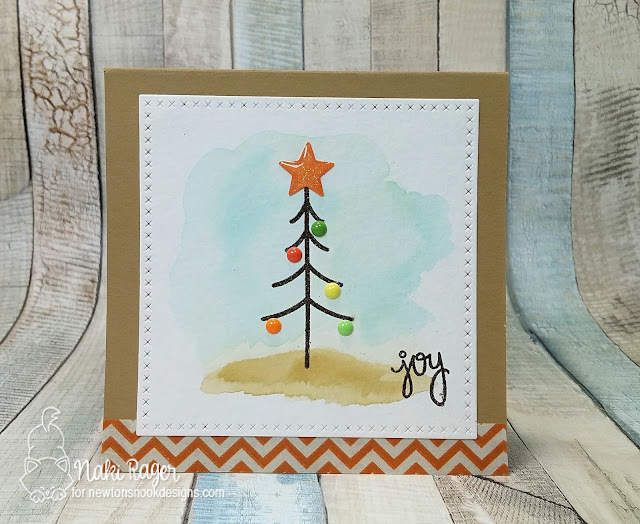 It was stamped with the Antique Linen Distressed Ink on watercolor paper then colored in with the Zig Clean cut Brush set and SU! reinkers. 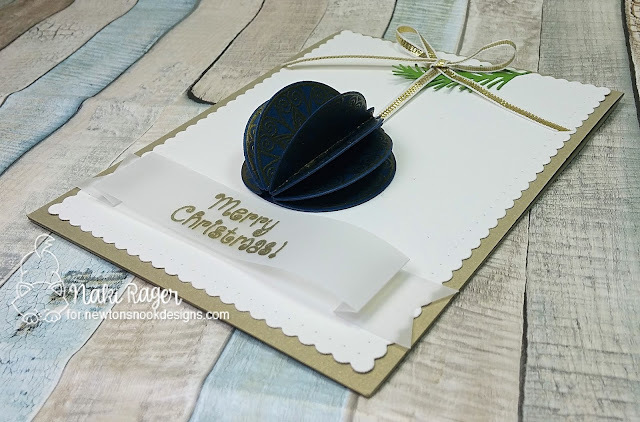 I stamped her hat again then paper pieced it to give some dimension. 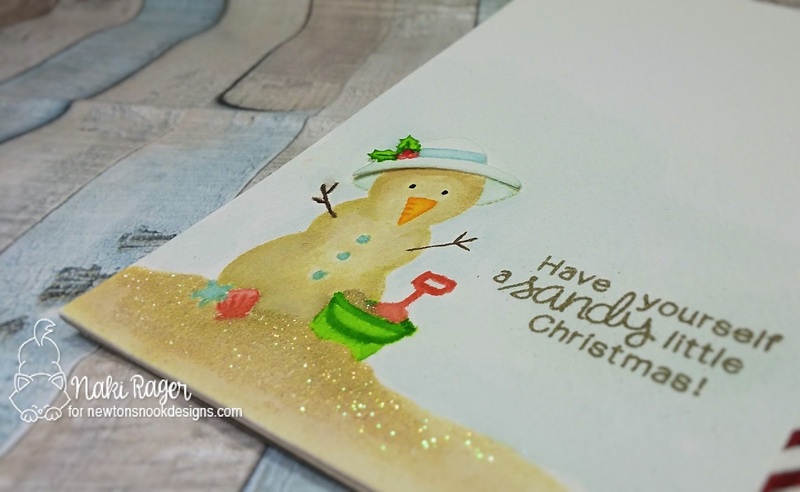 I applied Versamark ink with the Versamark marker on the sand, then added some glittery gold emboss powder. Isn't it pretty!? This week's sponsor is Bugaboo Stamps! One lucky winner will receive a $21 gift certificate, how awesome is that!? How stinkin' cute are they!!? 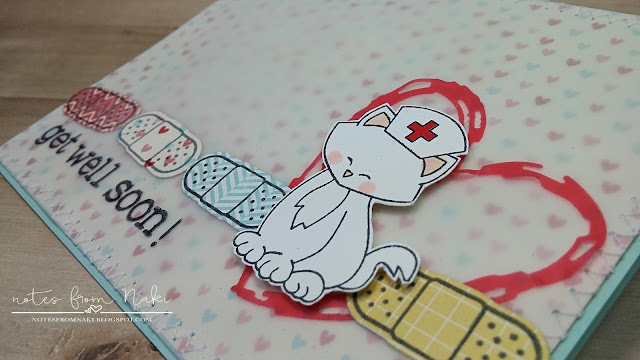 Isn't she the cutest little nurse ever!!? Make sure you link up you beautiful creation, I can't wait to see! 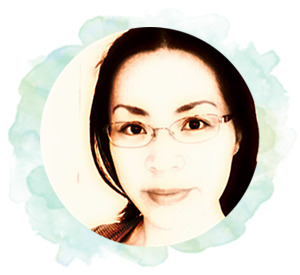 Hi there lovelies, Happy Friday! 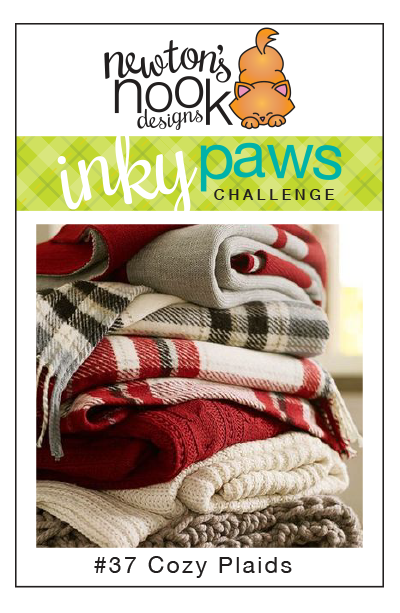 The new Inky Paws Challenge is starting today over at the Newton's Nook Designs Blog and I am joining the fun! What could be cozier than nice, warm, plaid blankets!? Not to mention they're so pretty! 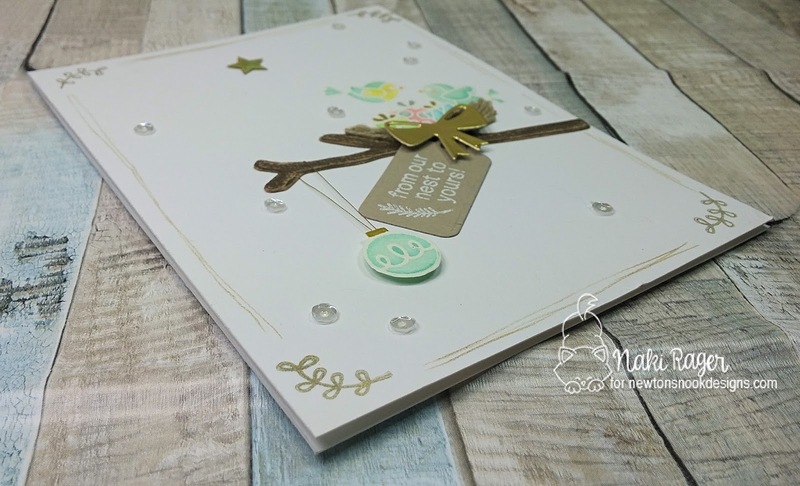 I have the perfect patterned paper for this card! 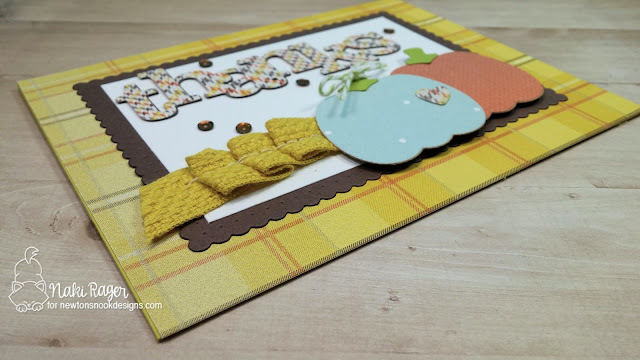 I first picked this yellow plaid paper, then got the other colors right from it. 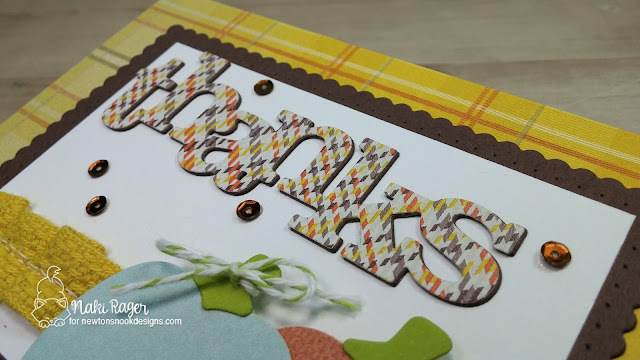 I even used another plaid paper for the sentiment! 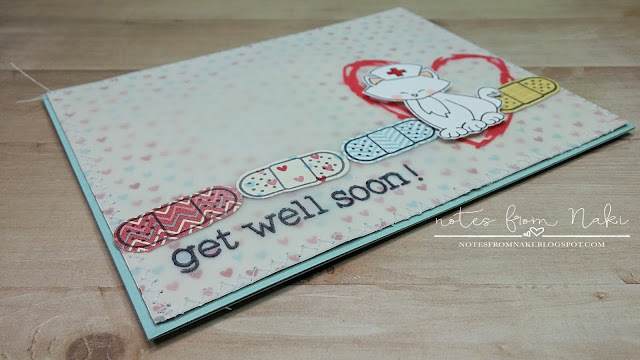 I layered a couple brown cardstock underneath the sentiment ti give a little dimension. 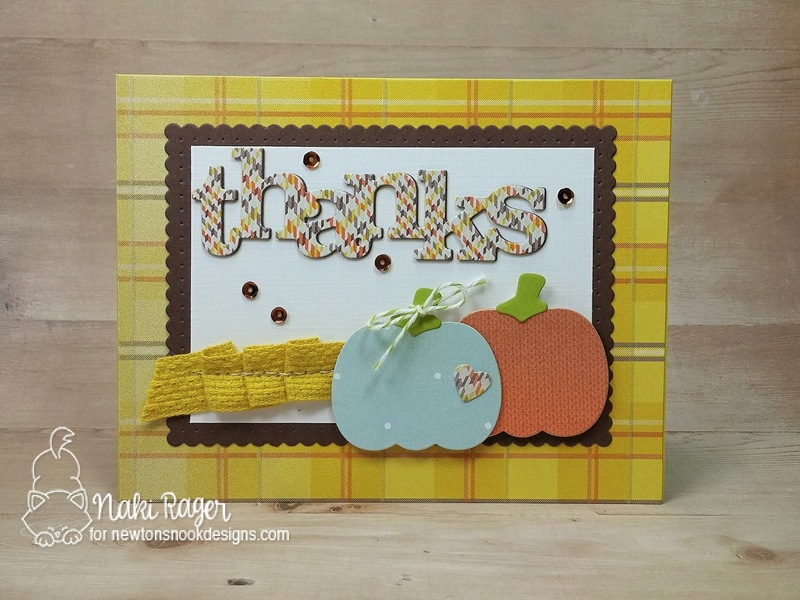 Look at all these warm, cozy colors! 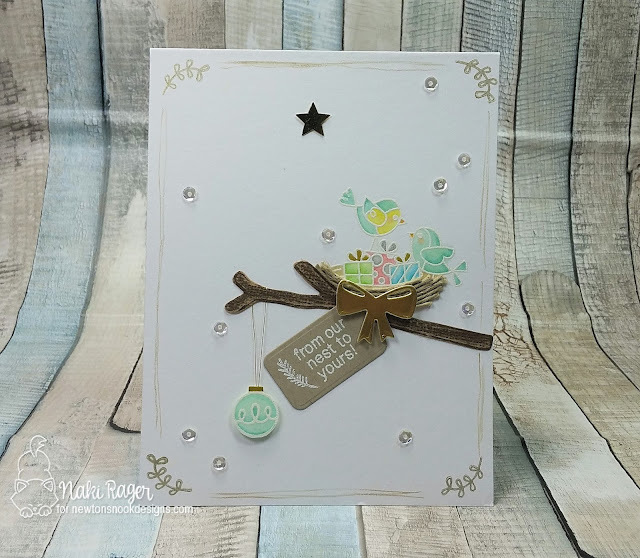 Then there is this light blue, just fabulous! Make sure you link up your cozy plaid creation too!